The old saying goes that the family that plays together stays together. For Tom and Laurie Foster and their children, Chris and Megan, that saying holds true. Despite Tom’s high-level spinal cord injury, the family has traveled the world having physical adventures, from zip lining in Costa Rica to kayaking with whales in Alaska. Now they’re giving back to Craig Hospital to ensure that other families can have the same experiences. Tom Foster was paralyzed in a ranch accident in 1981. Following a three-month stay in an intensive care unit, during which he and Laurie were married by the hospital chaplain, he spent six months rehabilitating at Craig Hospital. The couple eventually settled in Oregon where they built and later sold a very successful gunsmithing business. Over the years they returned to Craig periodically for re-evaluations. The Fosters were introduced to the added possibilities of travel and recreation by Craig’s Therapeutic Recreation Adventure Program. After reading about the Sea Wolf program in an issue of “Movin’ On,” Craig’s alumni magazine, Tom Foster called Lori Womeldorff, CTRS, the trip’s coordinator, and arranged to go along, serving as a “guinea pig” to see if this type of trip would be feasible for Craig grads. The couple cruised the San Juan Islands, Washington, and Glacier Bay, Alaska, on the Sea Wolf, a 97’ ocean-going ship that holds 12 passengers and has been retrofitted for accessibility. During the trip, the adventurers saw killer whales, kayaked, hiked, and took a handcyle trip on Lopez Island. 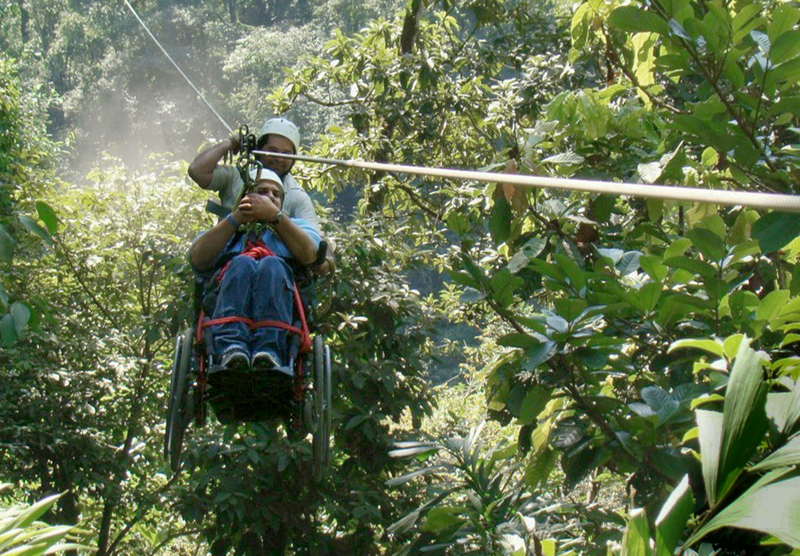 The couple has taken three more trips on the Sea Wolf with their family and in 2009 spent Christmas in Costa Rica, where Tom Foster went across the longest zip line in Central America— while strapped into his wheelchair. The Fosters, who recently donated to the ROI Capital Campaign, follow the mantra of former Crested Butte, Colorado mayor W Mitchell, who uses a wheelchair. When they got home from the first trip, Tom purchased his own handcycle so that he could get out and about while at home. The couple also contributes annually to a fund at the Craig Hospital Foundation to help other Craig families enjoy the trip.